Jacqui Briddell , ORANGE Magazine’s managing editor, interviews UT alumna Elizabeth Chambers Hammer at the Belo Center for New Media. University of Texas at Austin alumna, Elizabeth Chambers Hammer, spoke exclusively with ORANGE Magazine on Monday about how she used her journalism background to become a culinary entrepreneur and influencer, and how she “made it” in the media world. Chambers wears many hats: she’s a mother, tastemaker, journalist, and the owner and founder of the award-winning BIRD bakery. To some it may seem like she really does it all. 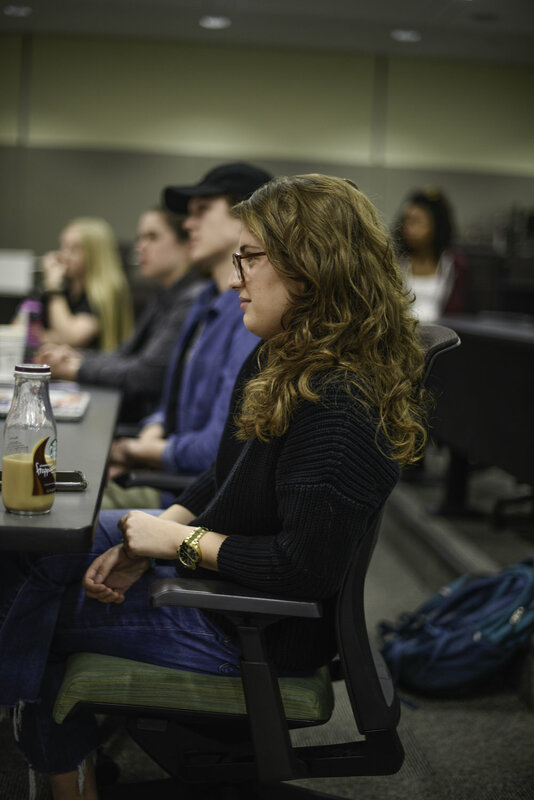 When sitting down with Jacqui Briddell, ORANGE Magazine’s managing editor, Chambers talked about everything from self-care to sugar cookies, as well as her experience studying broadcast journalism. “I think it’s a really beautiful thing that I can do news and cupcakes!” Chambers said with a smile. Monday’s visit was Chambers’ first time back on campus after she graduated from UT with a degree in journalism in 2004. Chambers’ Texas bakeries revolve around memories of her mother and grandmother. They are an homage to these incredibly strong, business-minded women in her life, she says. Chambers discussed her plans to open another BIRD Bakery in Denver, the city where she grew up and where her mother lives today, and shared with us her fantasy of high school students visiting her bakery instead of the local sandwich shop that was once her go-to lunch spot. “I love the nostalgia, I love the story, I love the full circle,” she says. With existing locations in both San Antonio and Dallas, Denver seemed to be the obvious choice for Chambers. “I basically open wherever I have free childcare,” she joked, explaining that she has family in all bakery locations. Chambers said she tries to dedicate at least two days out of the month to spending time alone with her husband - actor Armie Hammer - by getting away from their busy lives in Los Angeles. But when it’s time to work, Chambers told Briddell that she tries to be present when doing one specific thing. “Give everything its time and its place,” she says. In terms of personal brand building, Chambers gets it. Her Instagram, filled with family photos, luxurious vacations and award shows, almost seems too good to be true. Chambers had attended the 2019 Oscars the night before and was now sitting in Belo Center for New Media reflecting on her time at UT just hours after she spent the night on an airplane from California to Texas. The panel was hosted exclusive for ORANGE staff members. Although Chambers is a celebrity amongst many other titles, she gave advice like a mother, told stories like a journalist, and brought everybody their own longhorn-shaped sugar cookie as a reminder to follow their passions. Audience members pose with Chambers after the panel event.